This month, in honor of the Tour de France, I thought I would celebrate some of the mysteries that use France as a setting. In the next weeks, we'll travel from one end of the country to the other, check in with the police and private detectives, take a look at bygone eras, and keep tuned for the unusual. This week I'm calling "Potpourri" because I'm featuring three sleuths whose occupations have nothing to do with the law. Let's take a look, shall we? The first author I'd like to feature may be better known for another of his creations-- Paddington Bear. 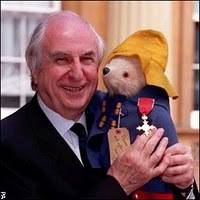 Writer Michael Bond has not only created a very famous and lovable bear, he's also written a mystery series for adults. 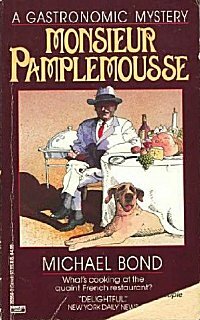 The main character in this series is Monsieur Aristide Pamplemousse, a Parisian gourmet restaurant guide inspector who has a bloodhound named Pommes Frites. The series currently has sixteen books, not all of which are in print-- but it's always fun to seek out books like this, isn't it? Three of the earlier books in the series are: Monsieur Pamplemousse (1985), Monsieur Pamplemousse Takes the Cure (1988), and Monsieur Pamplemousse Aloft (1989). Bond suggests. He is not explicit. His books can be hard to follow. 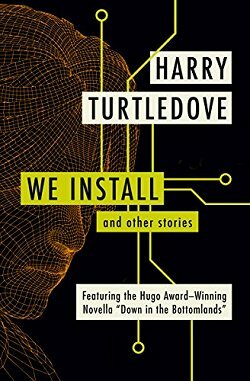 He points the reader in a direction, applies a subtle push via plot or dialog, and relies upon the reader's perception for the rest. 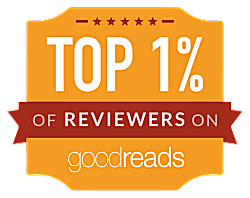 The results are hilarious--for a close and clever reader. Contrasting the humour are serious and mouth-watering descriptions of gastronomic experiences--food, wine, more food, more wine! and serious mystery in both plot and action. Enough straight plot-line to make the crooked forks really stand out. 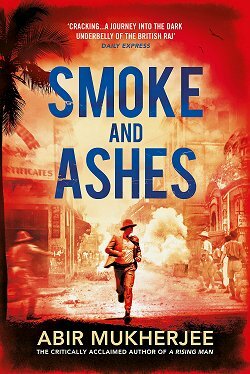 This is a fantastically well made novel, with highs and lows, good and bad people, well realised scenes and scenery, and amazing description of both environment and action. 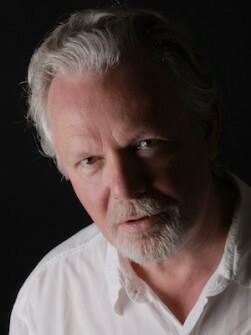 Born and raised in Scotland, author Peter May had a very successful career as scriptwriter and script editor on prime-time British television drama. 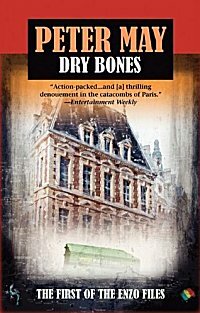 He now lives in France and concentrates on his first love-- writing novels. One of the series he's written features Enzo Macleod, a Scottish biologist teaching at Cahors in southwest France. Macleod bet that he could use his expertise to solve seven notorious murders described in a book on cold cases by Parisian journalist Roger Raffin. So far there are five books in the series. 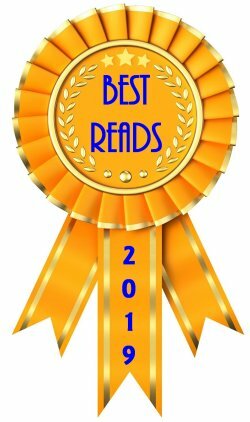 The first three are: Extraordinary People (2006) APA Dry Bones (2010), The Critic (2007), and Blacklight Blue (2008). The mystery inspires a bet, one that Enzo Macleod, a biologist teaching in Toulouse instead of pursuing a brilliant career in forensics back home in Scotland can ill afford to lose. The wager is that Enzo can find out what happened to Jacques Gaillard by applying new science to an old case. Enzo comes to Paris to meet journalist Roger Raffin, the author of a book on seven celebrated unsolved murders, the assumption being that Gaillard is dead. He needs Raffin's notes. And armed with these, he begins his quest. It quickly has him touring landmarks such as the Paris catacombs and a chateau in Champagne, digging up relics and bones. Yes, Enzo finds Jacques Gaillard's head. The artifacts buried with the skull set him to interpreting the clues they provide and to following in someone's footsteps--maybe more than one someone--after the rest of Gaillard. And to reviewing some ancient and recent history. As with a quest, it's as much discovery as detection. Enzo proves to be an ace investigator, scientific and intuitive, and, for all his missteps, one who hits his goals including a painful journey toward greater self-awareness. 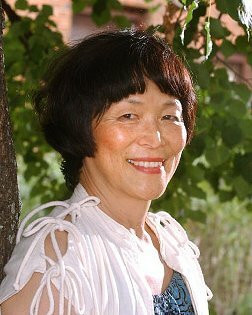 Michelle Wan was born in China, grew up in India and the United States, got degrees in Anthropology and Geography, taught English in Brazil, worked in many different fields-- and traveled a lot. One day in the Dordogne in southwest France, she found her first wild orchid in the middle of a logging trail. She was hooked immediately, and suddenly everything came together: murder, orchids, and the Dordogne. Wan writes a series featuring Mara Dunn, a French-Canadian interior decorator who's relocated to the Dordogne region in southwestern France. The author is inspired by the flora, food and people of her favorite area of France. The series currently has four books: Deadly Slipper (2005), The Orchid Shroud (2006), A Twist of Orchids (2008), and Kill for an Orchid (2010). Orchid fever rules this impressive debut novel. The desire to discover a new variety of orchid draws a young woman, Bedie Dunn, into the Dordogne region of southwestern France. She never returns from her expedition, however, and the case grows cold until her twin sister, nearly 20 years later, discovers the camera Bedie took with her, along with a number of photographs of wild orchids. The surviving twin seeks out an expert on orchids, who lives in the Dordogne. Smart move, both for atmosphere, character, and plot. Readers will gain a wealth of insiders' insights into orchids as the twin sister and reluctant -botanist-sleuth explore the rugged landscape of the Dordogne. 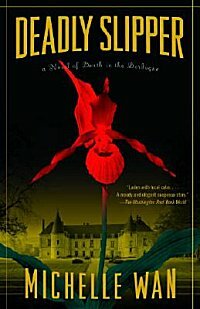 The fact that the botanist is also a fevered orchid enthusiast heightens suspense throughout: Is he helping to find the missing sister, or setting up the surviving sister for his own gain? I don't know about you, but I've just added some books to my wishlist and have one or two heading for my mailbox as we speak! 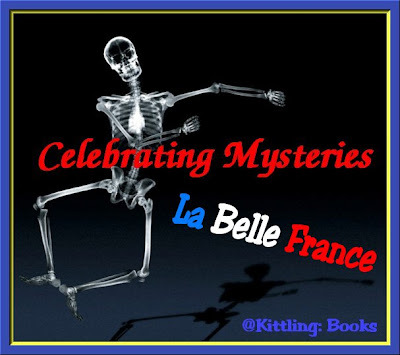 Stop by next week when Celebrating Mysteries in La Belle France continues! Three more books to add to my TBR mountain! I have Deadly Slipper but had forgotten about it until now. And I may have read a book by Peter May in a different series (but I'm going to check that). That first series sounds like a lot of fun so I will try to find the first book. The Michael Bond and the Peter May series look good. Sakura-- I didn't either until I began researching this post! Pepper-- I know... I'm trying to get my hands on the first books in those series!